This uber cool box set collects a decade of the Chasers as they take the Mickey out of politics. This box set includes The Election Chaser (2001), The Chaser Decides (2004), The Chaser Decides (2007) and Yes We Canberra (2010) with a plethora of unseen footage as a bonus. 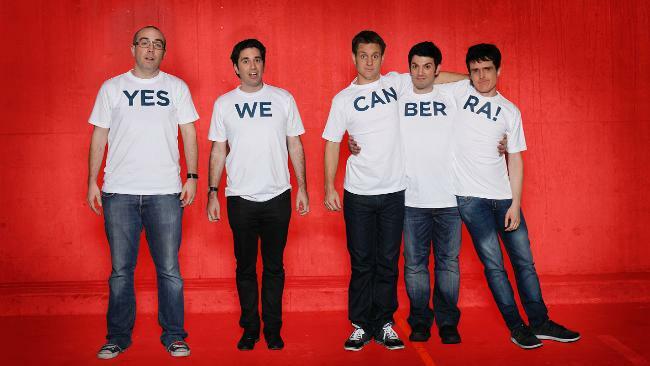 For those not in the know, the Chaser's crew are a witty group of individuals who really know no boundaries when it comes to their comedy and on more than one occasion, they had to "apologise" for one of the comedic stunts. The Chaser's is made up of Charles Firth, Dominic Knight, Chas Licciardello, Julian Morrow, Craig Reucassel, Chris Taylor and Andrew Hansen. Unlike some comedy "teams", everyone in The Chaser's is amusing and whether it's Andrew Hansen singing a song about politics or Chas Licciardello following a politician down the street, all aspects of their comedy will put a big fat smile on your face. Another amusing aspect about The Chasers Election Campaign box set is that all the politicians that they visit from John Howard to Kevin Rudd, Tony Abbot and even Julia Gillilard is that many of these politicians have no sense of humour at all. Whereas some… actually ham it up for them which is more so evident in their Yes We Canberra! For those that can’t ham it up for them when they are in the spotlight for the wrong reasons, some find it quite difficult to retort to their targets. It's just a joy to watch, especially given the dry political climate. 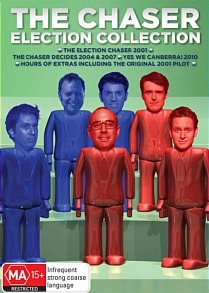 Apart from a healthy amount of "Champaign comedy", this box set includes over 2 hours of special features that include The Original Election Chaser Pilot (2001), Commentary by The Chaser team and Andrew Denton, Executive Producer of the 2001 series, Digitally remastered jokes, Four identical replays of that old Ma Meninga clip, Dated jokes about Meg Lees... and seriously... hundreds of other classic moments that turn out to be note quite as funny you remember them being.